Within the cemeteries of Medina County, Ohio there can be found many headstones marking the final resting places of men who served our nation during times of war. These monuments tend to make us pause longer than most. We ponder the sacrifices made and our gaze upon these markers carries down with it gratitude and respect. While the tombstones of some veterans are clearly engraved with details of the individual’s military service, others are not. Hiding in plain sight, they simply stand there quietly waiting for someone to recognize them. Identifying them requires specific knowledge usually found by searching military records. Frederic Jones, who is buried in the Old Town Graveyard in Medina, is said to be one such `hidden veteran’. It has been reported by various persons over the years that this Fred Jones was a veteran of the Revolutionary War. After reviewing the evidence, it is my opinion that this Fred Jones is absolutely not a veteran of the Revolutionary War. While I cannot pinpoint exactly how the mixup occurred, I do believe I can show why the mixup exists. 1. A military record exists for a Fred R. Jones who enlisted May 5, 1777 in Rhinebeck, Duchess County, New York as a private in Lieutenant Cornelius Elmandorph’s Company, commanded by John R. Livingston, the proprietor of the Powder Mill in Rhinebeck. Fred served one month and 27 days before being discharged on June 30, 1777. The military record is an actual document and not in dispute. That being said, all this means is that a man with the common name of Fred Jones served briefly in the Revolutionary War. We’ll call this `Dot #1’. 2. A headstone in the Old Town Graveyard (Old Medina Cemetery). It has been said to read: “Frederic Jones, died Aug. 20, 1811, aged 60y”. Do the math and that means he was born in 1751. This is `Dot #2’. How these two `dots’ were connected is still a mystery to me. Any presumption that they are the same man is certainly a stretch without some form of corroborating evidence. None exists. Where was this man in the years between 1777 and 1811? When or why did he come from New York to Ohio? Why are there no family members or descendants either buried with him or found in Ohio afterwards? These are very important questions that need answering if one is to make the connection between a man who was in New York in 1777 and one who died in Ohio in 1811. That’s 34 years and a lot of miles. Specifically, focus on the year of his death. That 1811 doesn’t look quite right, does it? The first 1 and the 8 are fine but the last two digits – 1 and 1 – seem suspect. Look at the spacing of those numbers as compared to the first two digits. They are spaced a bit wider aren’t they? That is because they aren’t ones (1) at all. Those are number fours (4). This Frederic Jones died August 20, 1844 at the age of 60 years. That means he was born in 1784 and could not have fought in the Revolutionary War. Add in decades of weathering and you have a bunch of fours that look like ones. It isn’t just the headstone today that supports this 1844 date. In 1910, the Gazette ran a series of articles which detailed the individuals buried in the Old Medina Cemetery. Indeed, over a hundred years ago, the July 22, 1910 Gazette (pg. 7) proves that someone read this same headstone and recorded it with the date of 1844. The article would point out interesting tidbits about persons or families buried there and it makes no additional reference to Jones as a person of interest. Just another burial from the 1840’s….. Even the survey of the stones completed by the Medina County Genealogical Society for its 1983 book, Tombstone Inscriptions from the Cemeteries in Medina County, Ohio, was able to come away with the date of 1841. They misread the age as 50 instead of 60 though that is the precise area where the stone is broken. How could someone have misread the stone as 1811? The photo above was taken on a bright sunny day with perfect contrast on the area in question. If someone were reading the headstone on a gloomy day or with less than ideal lighting, the stone could easily appear to say 1811 to a person inexperienced in what to look for. The photo is taken from straight away at ground level. Any person standing, or even crouching a bit, would lack this ideal view. That’s how the stone could be misread as 1811. Rather, the question should be: how have three different persons over the span of 100 years (1910-2010) gotten fours from the same date where others have gotten ones? When the details of the number four (nose, etc.) are worn away, distinguishing it from a number one can be difficult. One can look at the two numbers (like on our Frederic Jones stone) and see how this occurs. We know the first digit is a number one. Compare it to the last two digits and they are mostly indistinguishable. Go back to 1910 and we have a headstone that would have been much less worn. Someone looked at that headstone and saw two number fours. There must have been details of the numbers still visible. Back in 1983, someone still saw enough to write down 1841. Today, I cannot make claim to viewing any of those lost details. My conclusion is based on area history and the spacing between the last three numbers. The spacing between the 1 and 8 is not much different than the spacing between the 8 and the first 4. The spacing between the first 4 and second 4 is much greater. Why is this? Shown exactly as they were typed, and without making any spaces, note where the `uprights’ of the number ones are situated within the space allotted for each digit. Compare this to where the `uprights’ are located for the number fours. See how the ones are situated more to the left? This is important because if one assumes that the space between the first number one and the eight is representative of the entire date, you could suggest that it is really 1814. Actually, the space between the digits is much smaller with the number one occupying its normal `to the left’ positioning. Then keep in mind that the space between the two fours represents the combined area of three things: the tail of the first four, the actual space between the numbers, and the nose of the second four. I had wondered this myself but if you print out the photo of the stone’s date and draw in the fours, it all makes sense. 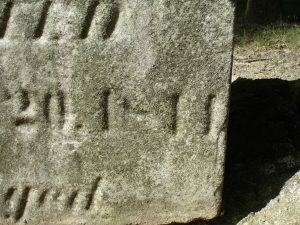 From almost twenty years of experience reading old tombstones in Medina County, I can tell you that anytime I see a date in the 1810’s it draws my attention. It’s not impossible, but it is rare and requires an investigation of the circumstances. That being said, here are a few additional things that cast doubt about a date of 1811 on this headstone. 1. The 1881 History of Medina County pretty much lays out the firsts and early dates for the county. It tells of how Joseph Harris, George Burr, Russell Burr, Calvin Corbin, and Lyman Corbin (and families) settled Harrisville in 1811. In Liverpool, it was Justus Warner, Alpheus Warner, and Moses Demming (and families). Given the `trouble’ with the Brits at the time, there was no further settling of the area until 1814. The first permanent settler in Medina Twp. was in late 1814 when Zenas Hamilton and his family settled. The village of Medina was laid out in 1818. These dates aren’t uncrossable boundaries BUT I can tell you that in Medina County’s cemeteries, I can’t think of one instance where they were. 2. More from the 1881 History: The first death in Medina Twp. is given as being a young daughter of Asahel Parmelee in the spring of 1817. Nothing is said about the first burial although that of Isaac Pond in August of 1819 is the earliest mentioned. The death and/or burial of a Revolutionary War veteran would hopefully be recalled. Particularly when compared to that of a child whose family was simply passing through the township at the time and whose burial is not mentioned. 3. The next earliest burial in the cemetery is that of Anne Munson in 1825 – 14 years later. Not an inconceivable gap – especially given that stones could be missing or graves unmarked – but still notable for a cemetery this large. Might Jones have been buried elsewhere originally and moved here later? Possible, yes, but another question is raised: why? When individuals are disinterred and then reinterred in another cemetery, it is almost always done by a family member that has purchased a lot and moves them to be buried with the rest of the family. We see this many times with regards to those disinterred from Old Town and moved to Spring Grove. There are no visible connections to suggest anything like this happened with Frederic Jones. 4. The Jones stone looks like it is made out of white limestone. That type of material was booming for headstones in the 1840’s. Many early stones from the 1820s and 1830s in Medina County are made out of sandstone which was used a lot during those early days. Of course this stone could have been erected in the 1840s so it’s not exactly evidence either way. It doesn’t so much eliminate the 1811 date as it is just another thing that fits the 1844 date. For the Frederic Jones 1811 to be correct, it would mean that it conflicts with and predates the timeline of Medina Twp., the village of Medina, and Old Town Graveyard. It also makes him the earliest grave in Medina County – an honor known and documented as being Ruth Deming in 1812 in Myrtle Hill Cemetery in Liverpool Township. I believe that the mistake was originated sometime following 1910. Perhaps after misreading the stone as 1811, someone did the math and wondered if the man buried there might have fought in the Revolution. Perhaps they went looking for a military record or, worse, just assumed he fought in the war. The WPA map for the cemetery shows Jones as a veteran and this project was done circa 1940. Fur. infor. Western Reserve Chap. JONES, FREDERICK – Medina Co.
By Mrs. Harry A. Stebbins, Creston, O. B. 1751, d. 8-20-1811; bur. Episcopalian Cem., Medina, O. – Medina Co. 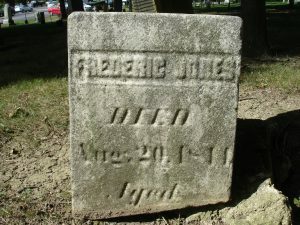 I checked the NSDAR’s Genealogical Research System, and though there are three different men by the name of Frederick Jones listed (this means that they are established and recognized by the National Society of the DAR as Revolutionary War soldiers or patriots), there are none listed who died in 1811 or 1844 and are buried in Medina County, Ohio. Of the three, two were born and died in North Carolina, and the other recognized patriot was born and died in Virginia, and all three died before 1809. The volume that you mentioned–‘The Official Roster of Soldiers of the American Revolution Buried in the State of Ohio’ was not compiled by the National Society of the DAR, but under the direction of the state of Ohio, –published by direction of Frank D. Henderson, Adjutant General, and John R. Rea, Military Registrar, and compiled by Jane Dowd Dailey, DAR State Chairman of Historic Sites and Revolutionary Soldiers’ graves of Ohio, 1923-1932. Though our library has copies of these volumes, we do not have any records relating to their compilation, as this was not a NSDAR undertaking. I wish you the best in your search for information about the Frederick Jones who is buried in Ohio. I contacted Pat Van Hoose who is the head of the James Fowler Chapter (Medina County) DAR and she was unable to find any information to help clear up the matter. Kathy Petras from the Medina Library suggested I contact the Wayne County Chapter since the submitter in one of the volumes is given as a Mrs. Harry Stebbins of Creston, Ohio. I contacted a P.J. Stebbins online who is the granddaughter of Mrs. Harry Stebbins. She told me that Frederick Jones was not a relative so far as she knew and that she had no idea how/why her grandmother had been linked to the submission of that name. I then contacted Janet Welty of the Wayne County Chapter DAR and she had no record for a Mrs. Harry Stebbins or any submissions related to Frederick Jones. So it seems that the first two books – those compiled by the DAR – are compilations from its various state chapters that contain a lot of unsubstantiated material. This collection of abstracts of grave sites contains information originally published in the Senate documents of the National Society, Daughters of the American Revolution, as well as the Society magazine. Using this book. While all of these reports are available at DAR headquarters, there is little if any information available there to link these references to specific sources of proof, to provide researchers with details as to why a grave was marked or to verify the listing of a located grave as indeed being that of a Revolutionary War patriot. Many listings, particularly the earlier ones, were not substantiated; all information should be independently verified and proved before being submitted to any patriotic or hereditary society for application or other purpose. So while we have four `separate’ sources which would seem to validate the claims of Frederic Jones being a veteran, we actually have two from the same unsourced compilation whose information was then copied and republished later by two others. Notice how the listings never offer anything more than what came from the misread headstone (i.e. no day or month of birth). There isn’t even a mention of military service details (enlistment, company, rank, etc.). I do not believe the Frederic Jones buried in the Old Town Graveyard was a Revolutionary War veteran. I have provided a number of pieces of evidence or arguments which I believe cast substantial doubt on his being a veteran. Furthermore, the sources that claim he IS a veteran consist of compilation books uncorroborated by any actual evidence. Even if, for the sake of argument, one contends that the tombstone reads 1811, it doesn’t mean that he was a Revolutionary War veteran. Likewise, the presence of a military record for a man with the name of Fred Jones does not prove any connection with the man buried here in Medina. I believe that the only reasonable stance on this matter is to assume he ISN’T a veteran until evidence is found to prove otherwise. It is certainly more likely and safer to assume that he is not a veteran – as one would do with any adult male burial in any cemetery. The burden of proof lies with those who want to show that he was a veteran. The investigation needs to start from the beginning and if a proven connection cannot be made he should not be listed on a veteran roster. I have no stake in this argument and simply wish to see the truth documented. As it stands today, I would have to list Frederic Jones with the 1844 date and as not being a veteran.